Optional information on labels can provide lots of further detail about a wine. In Bourgogne, it can tell the whole story of the wine you are going to drink : where it comes from, how it was made, its vintage, and in some cases, the name of its producer, and so on. The winemaker can also complement the compulsory details and optional elements with any information that is deemed important: the history of the estate, the composition of the soil, plot orientation, advice for culinary combinations, and so on. • By distinguishing itself through a brand name and a commercial signature (2) : this is an aid for recognition. 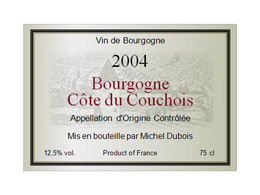 Only wines that have been granted an Appellation d’Origine can use the terms “Château”, “Clos” or “Cru”. 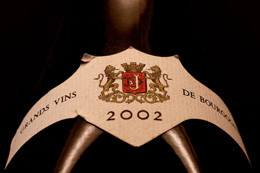 • By indicating the vintage (1) : the production from certain years enjoy an exceptional reputation. For this information to appear on the label, at least 85% of the wine must come from grapes harvested in the year mentioned. 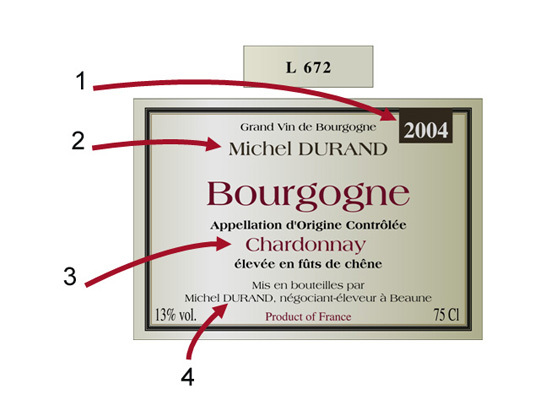 • By noting the name of the varietal (3) : this information, authorized on the labeling of certain appellations Régionales Bourgogne wines, gives you additional detail. A single varietal can be declared if the wine is made from at least 85% of that grape type. If two or three varietals are mentioned, the wine must only contain the named grape varieties. • The method of production demonstrates a set of skills and reflects a passion. You may find out about the age of the vines (e.g. “vieilles vignes”, or old vines), the harvesting method (e.g. “vendanges manuelles”, or hand picked), or else details of the vinification and ageing. • A particular growing method, spotlighted by the producer, proud of a conviction that he or she wants to share. Since 2012, labels can include, for example, the mention “Vin biologique” (organic wine), if a state-approved national agency has granted the producer an organic label, in accordance with French and European specifications. (This precise detail also covers the method of vinification). • Details of the commercial structure (4), notably for wines sold by cooperative cellars. • Medals : these will help you in your choice. If they appear on bottles, they can only refer to competitions recognized by the French Ministry of Agriculture. This list is not exhaustive, since legislation allows for further optional information to appear on labels.